​ The quilters are continuing their work on the quilts to be awarded to veterans in the spring. On the first and third Tuesday of each month you will find us hard at work sewing machines on high speed, rotary cutters slicing through yards of red, white and blue and irons at the ready. The quilters are excited to honor our church members who have served our country through military service. We want to honor all who have served in any branch of the military. If you are a veteran and have not signed up yet, there is still time. If you have a question about eligibility, contact Linda Smith or any of the quilters. The signup sheet is in the narthex, or you can email your branch of service and dates to the church office. Once all of our church family “veterans” have received their Quilt of Valor, we will turn our attention to the extended family and friends that have signed up. Please be aware that we need to have the branch of service and service dates for these veterans also. It is estimated that these quilts will be presented late summer or fall of this year. Note: the next workshop will be on Jan. 22 because of the holidays. February will be back on schedule on the 5 and 19. We will also adopt the weather policy of not meeting if the schools are closed or delayed. Stay home and work on those UFO’s! The Quilters have decided that during December we will take a break from our service project honoring veterans. We will continue to meet on December 4 and 18, but it will be to work on our own projects. December will be a “PPC” month or panicked project completion month. So, if you would like to join the fun, need advice about a project, or just need some dedicated time to complete that last-minute gift without distraction, these are the work days for you. Bring your project and all necessary tools, your lunch and enjoy the comradery of other stitchers. 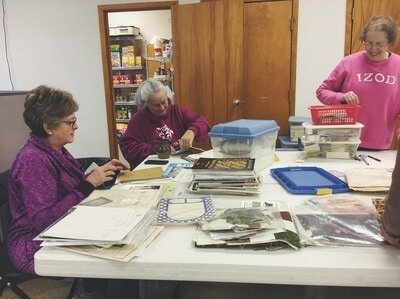 Quilts of Valor workshops will begin again on January 15. 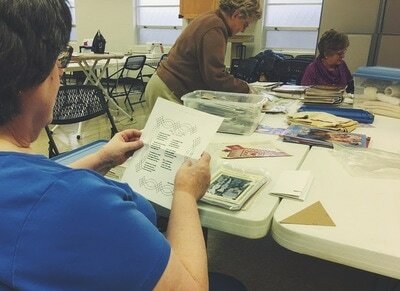 First Quilters of First Christian Church is a registered Quilts of Valor Foundation group. These dedicated women gather twice each month to cut, piece and complete the quilts presented to U.S. veterans from First Christian Church. The group began as a way to honor our veterans in conjunction with our 125th birthday celebration in 2018, and have found a strong commitment to this outreach mission. Through this ministry, friendships have deepened, and a sense of purpose keeps our hearts full. You can be assured that every stitch in these quilts is made with appreciation for the veteran’s service to our country. The mission of the Quilts of Valor Foundation is to cover service members and veterans touched by war with comforting and healing quilts! In the last 15 years over 178,000 quilts have been awarded to deserving veterans. In July of 2017, nine veterans received their quilts. 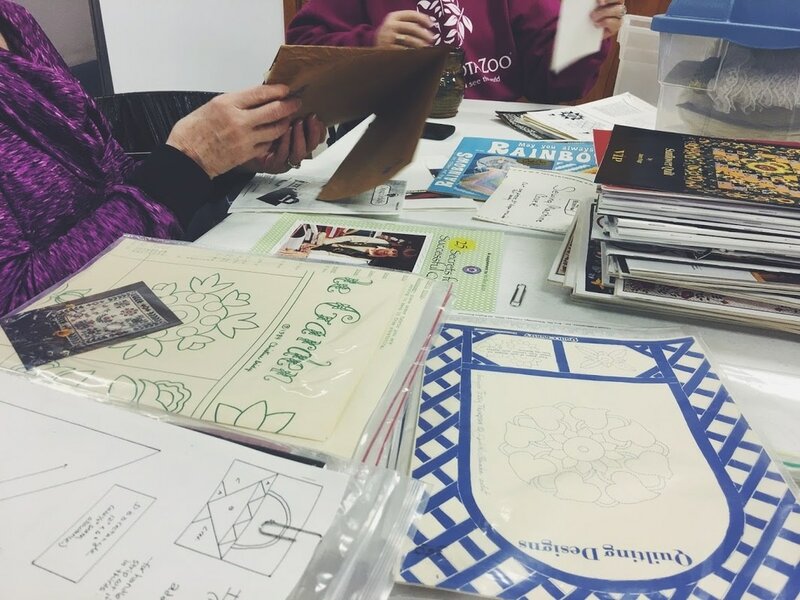 Join First Quilters as they create quilts for Veterans. They meet regularly on the first and third Tuesdays at 9:00 AM each month. ​ The First Quilters of First Christian Church donated the quilt “Hero’s Tribute” to the Grout Museum District for a silent auction on April 28. At this fund raiser, winners of the Sullivan Brothers Outstanding Military Family Award and the Van G. Miller Memorial Award for Outstanding Support for Our Armed Forces will be recognized. Kathy Redding is the Silent Auction Chair and asked the First Quilters to participate. It is our honor to be a part of this project. UFO Workshop aka UnFinished Objects Workshops are held on the fourth Tuesday of each month in Fellowship Hall. Doors open at 9:00 AM. Bring your lunch and join us with your special project.